Mahe Mir will be released across Pakistan on May 06, 2016. 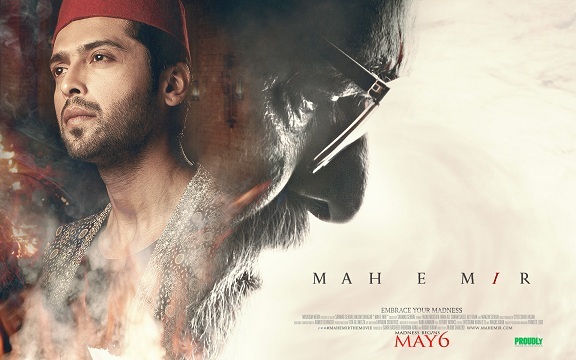 Iman Ali, Fahad Mustafa, Sanam Saeed, Aly Khan and Sarmad Sehbai are part of this film. Prior to that, song launch will take place on 14th of April in Dubai. Music launch ceremony will be held in Karachi. Music of the film is produced by Syed Shahi Hassan. Mahe Mir is a film by Sarmad Sehbai and Anjum Shahzad. Created by Sarmad Sehbai, Directed by Anjum Shahzad and Produced by Sahir Rasheed Khurram Rana. Mahe Mir is the story of a young anarchist poet. The film is set in contemporary times. In this movie, the young poet goes through the sufferings of love, separation and poverty which drive him to madness in which he discovers the 18th century ‘god of poetry’ Meer Taqi Meer. In his poetic journey he embodies the intense love, the passion, and the creative madness of the poet. Mahe Mir is a movie set in both contemporary times in modern day Karachi city and 18th century Dehli. Primarily the mood leads the style of film, without disturbing its feel with deliberate shots and angles. Each frame is charged with sensuousness and the rawness of emotions.